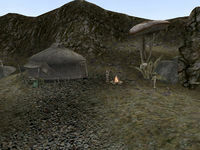 Kaushtababi Camp is a small Ashlander camp south of Molag Mar, just over the mountains. It is mainly significant as the home of Adibael Hainnabibi, who is the master trainer of Athletics. His colleague, Assurdan Serdimapal, is also a trainer, though less skilled. In addition to Athletics, Hainnabibi is also a major trainer of Long Blade and Block. Serdimapal offers moderate training for the same skills as Hainnabibi, including Athletics, Long Blade and Block.